SYNOPSIS: About to be executed for murder, Yelena is offered an extraordinary reprieve. She’ll eat the best meals, have rooms in the palace—and risk assassination by anyone trying to kill the Commander of Ixia. A wonderful read which got me anticipating everything. I rarely give a high rating for the first books in a series. This is because I usually anticipate the second book to be more of less wonderful than the first. As for this, I really loved the story. Its pacing, characters and world was well thought. I think that making Yelena a poison taster was genius. She could serve as a maid or whatever but she was given a job as a poison taster. There aren’t lot of books with poison tasters as the heroine. It gave it a unique twist to the story. Also, I would not know if she would die in the end or what. As for Valek, his tendre came as a surprise for me. I was not expecting anything romantic from him. I was more inclined to think that he would be a mentor and good friend.The magic system in this book is not the centre of attention since Ixia is a non magical place and magic is banned. I really love this story. Every chapter made me want to read more. I’m just happy that there is a second and third book which would satisfy my cravings. I gave this story a 5 hearts and more rating because it was a wonderful reading experience. Even if some of the characters were to fishy for me, this added suspense to the story. Yelena’s occupation is very different. I liked reading how she learned about the different poisons. As for her love life, I have no complaints. She deserves someone to come home to even if its an assassin. I love how the story was written. The first chapters were climatic because she could have died with the strongest poison, butterfly’s dust. This did not happen and she became the official poison taster. Also, she was able to have friends and train with weapons so that she may survive since a corrupt official wants to kill her. So with that, I really love this book it had all the elements in a book which I like. It had magic, romance and a spunky heroine who would do anything to survive. Disclaimer: This review is my honest opinion on the story. I did not receive any kind of compensation for reading and reviewing this book. I am under no obligation to write a positive review. 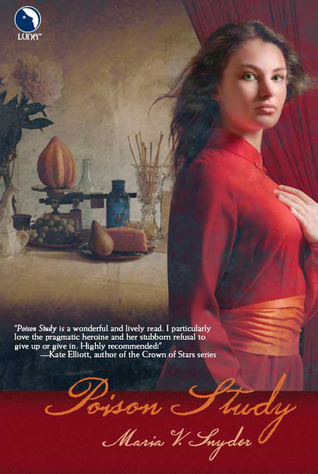 I purchased my own copy of Poison Study by Maria V. Snyder. The book photo and synopsis here is from goodreads.com. I really liked this book. For me watching Yelena learn about poisons was one of the most interesting parts as well. hahaha.. I love Maas’ books too.. as for the age gap here I never minded it.. I just did not see them as a couple..more like a mentor and close friend..